The bathroom is one of the parts of the house that should always be shining. And it is that there is no worse image than that of a dirty toilet, a bathtub with scraps of soap or tiles with stains. Cleaning the bathroom should be to conscience, which will normally be a nuisance. To do this task easier takes note of the advice we give you below. We all like to take a pleasant shower or a relaxing soak in a bathtub with hot water, foam and salts. The worst comes later, when it comes to cleaning. Try to mix baking soda with vinegar or lemon juice and a little water. With a sponge or cloth, apply this mixture over the bathtub and faucets. Remove quickly the spots from water level and dirt. You can also place soaked paper napkins in the mixture on the stains, let it act for a few minutes and then remove them. When cleaning the sink, you can use this same technique. In the joints of the tiles is where more crap builds up. To leave them as the jets of gold you have to take a brush and soak it in a solution of bleach with bicarbonate. Then it is necessary to brush, of course, patiently. For the tiles, we mix vinegar and water in equal parts and we put it in a spray. 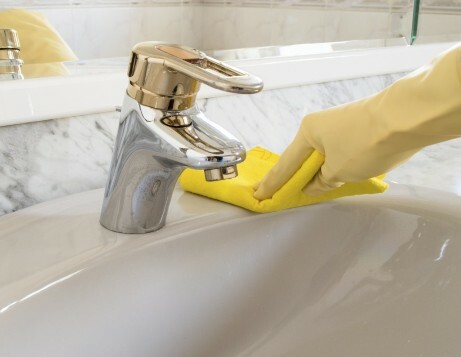 Sprays on each tile, let it act for a few minutes and then wipe a cloth, you will see how quickly the moisture stains and the fungi that accumulate disappear. This mixture can also be used to remove tartar from the shower. Forget about the usual glass cleaners. The best thing to clean splashes from the bathroom mirrors is a mixture of water, ammonia and alcohol. You have to put half of water, a quarter of ammonia and another quarter of alcohol. If you want to avoid the smell of ammonia, another option is vinegar diluted in water. To avoid leaving fibers on the surface of the mirror you can use newspaper. Perhaps the most complicated and unpleasant area, since it is where most tartar accumulates. It is advisable to use a metal sponge and alcohol or hot vinegar. For the spots that form in the background, try a cola drink. Pull the chain first and then pour half a can of cola, stir with a brush and wait half an hour. Pull the chain again and you will see how the stain disappears. In order to save as much time as possible in cleaning the bathroom, always have the right utensils at hand. The mixtures are prepared in sprinklers and always use a brush to clean the toilet after use, so it will be easier to clean.